Set your time machine for Santa Rosa, 1910; there was no better time during the early 20th century to live here. Even now, it's an absolute pleasure to read the old newspapers and watch that year's adventures unwind. It was an election year and that always charged the air electric, particularly over at the Press Democrat where politics was something of a blood sport. There were four sensational murder/attempted murder cases, one which occurred during the performance of a play and one which was dramatically reenacted in court (more on that later). It was the year for Halley's Comet and for a week or so it seemed that almost everyone was holding a "comet party," sprawling on their lawn after dark in their nightgowns (more on that later, too). But more than anything else, it was the year when Fred J. Wiseman and his airplane mesmerized the town. Over forty articles about him appeared in the local papers that year alone, many to report that the machine was being repaired, moved somewhere, or something was supposed to happen but didn't. When the public even wants to hear about what you didn't do, congratulations; you have achieved celebrity status beyond today's Kardashians. Even without Wiseman's boost, Santa Rosa joined the rest of the country in going plane crazy that year. So wrought the brothers Wright that barely a week went by without newspapers reporting a flight record being broken or a plucky aviator barely escaping death by plummet. Sunday editions offered poems about flying, features about industrious children building gliders that were surely destined to break their limbs, photo spreads of dinky aircraft silhouettes flying in the distance and silly essays about impossible things, such as someday there would be trans-oceanic voyages by air (at 100 miles an hour!) or that wars would be fought by armies of bird-men. Americans were hungry to participate by watching all that record-setting (and maybe plummeting) but opportunities were few. 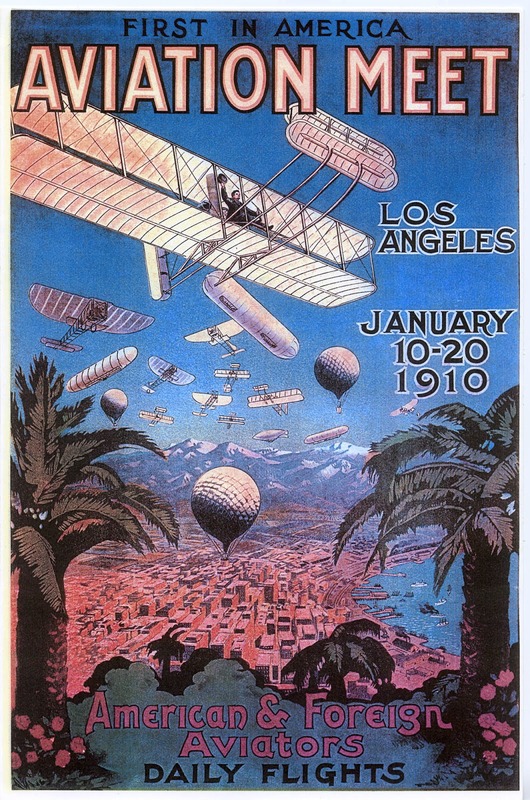 The first public West Coast flying exhibition came in Los Angeles during January, 1910. There French aviator Louis Paulhan flew for 35 minutes under ideal conditions, even bravely venturing out over the ocean. Others flying at that show included Charles Hamilton (more later) and aircraft designer Glenn Curtiss. Also: An Army officer in a dirigible tried to drop dummy bombs on a target, always a crowd favorite. The "air meet" moved to the Bay Area a week later, promoted by William Randolph Hearst - stop by an Examiner office for a half-price admission coupon - but Paulhan was the only pilot who flew. Weather was bad with 30 knot gusts; after a two day wait he finally made an eight minute hop when winds calmed at sunset, yet there were still 20,000 waiting to see that moment. Such was the fascination. A few weeks later, the Santa Rosa Chamber of Commerce announced "initial steps were taken for holding a big aviation meet here at an early date...There will be at least three major flights scheduled for each day, one of which will be a cross country flights and back, with Petaluma, Healdsburg or Sonoma as the objective point. There will be at least three aviators present." It was just big talk by a couple of promoters and nothing came of it, but there are a few details worth noting. First, Chamber of Commerce President Ernest L. Finley seemed enthusiastic about the idea, judging by the article in the Press Democrat, which was edited and published by Ernest L. Finley. Was he the same Ernest L. Finley who wrote a 1905 editorial declaring that "the so-called flying machine [will never be] useful for any practical purpose"? Why yes, he was. The only aviator apparently contacted about participating in the Santa Rosa air meet was Frank Johnson, a portly San Francisco clubman who was just learning to fly - somewhat. Johnson had purchased a Curtiss biplane for $8,000 at the Los Angeles exhibition but sold it a few months later after dropping it into San Francisco Bay. The SF Call wryly noted he had "other harrowing adventures in which his aeroplane crashed into fences and chased crowds of spectators around the field." Perhaps it was a good thing that there was no air meet here for him to exhibit his skill at terrorizing audiences and general mishaps. It's also interesting that the PD article did not include any local "bird-men." Charles Hamilton flew at the LA exhibition and elsewhere as the main demonstration pilot for Glenn Curtiss' biplanes, but he was well known in Santa Rosa as a parachuting balloonist in prior years and in 1910 bought a home nearby. More significantly there was no mention of Blaine Selvage, who apparently made the first controlled flight in California (and probably the West Coast) a few months earlier in Eureka, an event covered in the Press Democrat. Selvage was still in the area with his custom-built plane. And, of course, Wiseman was not named as a flyer; just a day before the PD mentioned the planned air meet, an item appeared on the front page of the paper noting that he had given up auto racing and "will henceforth devote his time and attention to aeronautics." Fred J. Wiseman was already somewhat a local hero for his winning record in auto racing; as an exhibition driver for a San Francisco dealership, the 34 year-old Wiseman had raced the powerful Stoddard-Dayton automobiles sold by his boss throughout Northern California and Nevada to much acclaim. But his attendance at the Los Angeles air meet that January cemented his ambitions to take up flying and to build an aircraft with his long-time racing partner and mechanic, Jean Peters (AKA J. W. Peters, Julian Pierre and John Peters). Funding the venture was a $10,000 investment by Ben Noonan, an old Santa Rosa friend and former business partner of Wiseman's as well as a race champ in his own right, having won the California Grand Prize Race a year earlier (Wiseman came in third). If they succeeded, it would be a sound investment; there was lots of money to be made in exhibition flying in those days. Louis Paulhan was reportedly earning $250,000 a year for appearances, the equivalent of over $6 million today. Working under a tent in a pasture - appropriately, about a mile northeast of today's Sonoma County Airport - they began assembling the flying machine the pair had started designing in San Francisco. About six weeks later their first test flight occurred. The Press Democrat printed a lengthy description of that version of their aircraft that will probably be of interest to historians (although not without mistakes; what they called "macadamite" was probably phenolic, for example, and poor Jean Peters was cleaved in twain, ID'ed simultaneously as "Julian Pierre and M. W. Peters"). The PD also erred in writing they were building a "Farman biplane." Today it's recognized that they ended up mixing features from Farman, Curtiss, and the Wright brother's designs. Given that the Wrights were already suing Curtiss for patent infringement, the hybrid Peters-Wiseman plane had the potential to win any competition for Aeroplane Most Likely To End Up In Court. Again the PD jumped the gun and promised the plane would fly a few weeks later at the Rose Carnival and they did participate, of sorts - but that's getting ahead of our story. For this installment we'll leave Fred soaring over the fields of Windsor to the delight of neighboring farmers. "Frequently the humming of the motor which is attached to the propeller of the flying machine has been heard of recent days," reported the Press Democrat, "and the people there have been on the tiptoe of expectancy awaiting the time when the big machine would be lifted into the air." If not a single other thing happened in 1910 worth remembering, that alone made it a terrific year. Edward Foley and Archie Levy, two well-known amusement agents, are here trying to arrange for an aviation meet. If given the proper encouragement they will bring Johnson, who operates a Curtiss biplane, and at an early date give a meet lasting two days. At a meeting of the Chamber of Commerce held Thursday evening, the initial steps were taken for holding a big aviation meet here at an early date. After a lengthy discussion of the matter, President Ernest L. Finley was authorized to name a committee to handle the proposition and sign all necessary contracts, when in its judgement, a satisfactory agreement with the aviators shall have been arrived at. The committee consists of...The committee will begin work at once, and unless something unexpected happens in the meanwhile, complete details will be forthcoming inside of the next few days. Varying programs will be arranged for each day, and it is possible that prizes may be offered for special achievements. There will be at least three major flights scheduled for each day, one of which will be a cross country flights and back, with Petaluma, Healdsburg or Sonoma as the objective point. There will be at least three aviators present. In addition to Frank Johnson and his Curtiss biplane, an attempt is to be made to have Roy Knabenshue and his big dirigible balloon take place in the meet. The arrangements now under contemplation provide for a two-day's meet some time this month and as soon as can be properly provided for. The meet is sure to draw an immense crowd, as Johnson will not show at any other point within a hundred miles of Santa Rosa, with the single exception of Sacramento. Fred Wiseman, well known in this city as a daring automobilists, [sic] has severed his connection with the firm of W. J. Leavitt and Company of San Francisco and will henceforth devote his time and attention to aeronautics. In conjunction with a number of other enthusiasts, Mr. Wiseman is now engaged in the construction of a Farman biplane, which it is expected be completed inside of a couple of months. A new and improved motor is a feature expected to work wonders in connection with the machine now in process of construction. Associated with Mr. Wiseman are several Santa Rosans, who have likewise become interested in the new form of locomotion. They claim to have a machine that will surprise all comers, and say their motor has many advantages over any now in use. The Peters-Wiseman aeroplane, upon which Fred Wiseman, Julian Pierre and M. W. Peters have been working since last October, was brought up from San Francisco yesterday by freight and unloaded at Mark West station, a few miles north of this city. There it will be re-assembled and its construction completed. The machine is housed in a huge tent that has been erected for the purpose on the Laughlin ranch, and when finished will be tested in the broad field adjoining which is admirable adapted to the purpose. The machine is about forty-five feet long and thirty-six feet wide, and is of the biplane type. Accompanying the outfit are several mechanicians [sic], all of whom are enthusiastic in their predictions as to what the machine will accomplish. Julian Pierre is in charge and under no circumstances will visitors be admitted to see the aeroplane or even allowed in the field where the tent is located. As near as can be learned, the first test is expected to take place about two weeks from date. Following several minor tests the Wiseman-Peters bi-plane made a perfect flight on Friday night in the big pasture field at the Laughlin ranch at Mark West, several miles from this city, where it has been assembled since the middle of March. Not only was the bi-plane built in Sonoma county, but the genius of Santa Rosa boys has achieved a triumph. They have a machine that won't stay on the ground, and in the air is perfectly under control of the aviator. As stated Friday night was really the first big test, the others having been principally to tension the mechanism. Twice on Friday night Aviators Wiseman and Peters circled the big field, soaring to a height of fifty feet, not attempting to fly high, however. This is but a foretaste of what may be expected. People in the neighborhood saw something Friday they had never seen before, and are loud in their praise of the achievement of the energetic young men who have done so nobly. Thousands of people will be delighted and interested to know that the Wiseman-Peters bi-plane will fly here at Rose Carnival time, and will be a special feature for Sunday afternoon, May 8, the day following the fiesta. In the meantime other tests will be made, and it is especially requested that people refrain from going to the Laughlin ranch to see the machine as in doing so they will only be hindering the finishing touches. Naturally everybody is excited and interested but the aviators and designers say they cannot explain things to the people just now as they have no time. People will have plenty of opportunities to inspect the machine as it will be on public exhibition here during carnival week and all parts will be then explained. It was on October 17, 1909, that Wiseman and Peters got their heads together and commenced the actual construction of the bi-plane, which is now an assured fact, and is claimed by experts to be possibly the most perfect one in existence. At the time both were employed in the automobile business of J. W. Leavitt and Co., of San Francisco, both fearless as auto racers, and both well skilled in mechanical art. From October until January 1 of the present year they worked with automobiles during the day and spent their nights evolving their ideas in connection with the bi-plane and in the manufacture of parts. In January they severed their connection with the automobile business to devote their entire attention to the construction of their airship. 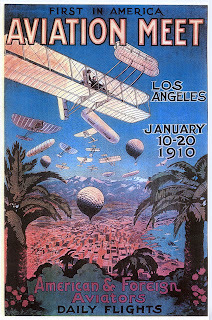 They took in the aviation meets in San Francisco and Los Angeles, examined carefully and intelligently the mechanism of the machines used there, and upon a comparison of notes determined to manufacture a bi-plane which would eclipse any of the great machines used in flights in either of those cities. Their knowledge of machinery and years of experience in the auto business was just the thing, particularly in the matter of engine construction. A San Francisco firm turned out the engine they designed. Then Wiseman and Peters rebuilt it and triumphed in the construction of an engine developing fifty horse power and weighing 148 pounds, including propeller, gasoline and dual Bosch system. Some idea of the fine points of construction can be gained when it is stated that in the manufacture of the sockets the builders have sixty-three different patterns on them and own them all, and have applied for patents. The sockets are made of Macadamite, which is stronger and lighter and looks like aluminum. The woodwork is all laminated, two, three and four piece, and is cut tapered to the wind. The ribs of the bi-plane are three lamination making the ribs about a quarter of an inch thick and half an inch wide. Yet one of these ribs is so strong that a big man can stand on it and it will not bend. The cloth is the best that can be procured anywhere in the world, and is manufactured specially for the purpose for which it is used. Three different styles of wiring have been employed in the construction of the bi-plane, similar to the network of wires one finds in a piano. In the network of wires in the airship there are 585 wires. The turnbuckles of different sizes are made of macadamite. The smallest turn buckle will stand a test of 1,150 pounds pressure; the middle one will not yield at a pressure of 1,940 pounds, and the largest one will not break at 4,000 pounds pressure. Before they got the kind of turn buckle they wanted for the machine Wiseman and Peters made hundreds of them and threw them away. The wheels re manufactured after the most approved style of workmanship for the purpose for which they are intended. In the rear of the bi-plane a light skid is used. The skid is of hickory which on the rear kite acts as wheels. The plane in front works alternately with the plane in the rear kite. In case the driver wishes to rise he raises the plane in front and that drops the one in the rear and the machine ascends. In balancing on a curve or turn or in a current of air he manipulates the controls with his shoulders. The seat is situated in front of the engine. There is an attachment in reach of the foot of the aviator by which he can control the height area of flight and speed. The total weight of the Wiseman-Peters bi-plane is 670 pounds. Five gallons of gasoline and three gallons of oil are sufficient for a twenty-mile flight. In the construction of the Wiseman-Peters bi-plane all the material used is California product with the exception of the cloth and propeller. The cloth and propeller were secured in a foreign country. In the selection of the wood used over thirty thousand feet of lumber was gone over and the selection made. Fred Wiseman has had entire charge of the construction work. In conjunction with Mr. Peters, and with the assistance of Don Prentiss they have carried out their design to a triumphant finish and Santa Rosa can well be proud of the fact that a Santa Rosa boy has figured so prominently in the invention. Ben Noonan is the general manager and treasurer of the company, Wiseman and Peters are aviators, and Don Prentiss is the secretary of the concern. All are deserving of the warmest congratulations. Wiseman and Peters are in San Francisco now selecting lumber for the construction of another bi-plane for use in case of accident. Another important feature about the Wiseman-Peters bi-plane is that it is practically the second American machine built outside of the Wright and Curtiss machines. The huge flying machine which was recently taken to the Laughlin ranch near Mark West station has been making successful flights into the air for several nights past. This is a great distinction for Santa Rosa boys Fred J. Wiseman, the racing automobile driver, is one of the aviators who has been making the flights and Peters, the mechanician, has also been seated in the big bird machine when it soared into the atmosphere. Residents of the vicinity have been much interested in the maneuverings of the big flying machine, and have matched its dainty evolutions in the air. The flights which have been made have been extremely successful, and demonstrate that the activities of the young men connected with the trials have been along proper lines. Don Prentiss, when seen Saturday morning, would not admit nor deny that flights have been made, but from the people residing in the vicinity it is learned that on Friday evening the big machine was frequently in the air with its burden of humanity, handling the levers. Frequently the humming of the motor which is attached to the propeller of the flying machine has been heard of recent days, and the people there have been on the tiptoe of expectancy awaiting the time when the big machine would be lifted into the air and perform evolutions. On Friday evening the residents had the satisfaction of witnessing the flight and of seeing the macine in maneuvering and turning in the air, indicating how easily it is controlled. From the descriptions given of the aerial flights, the machine is in every way an unqualified success, and much is expected of it in the future. It is most likely that the machine will be exhibited here during the carnival and probable that flights will be arranged for the afternoon of Sunday, May 8, the day following the carnival. The machines is known as the Wiseman-Peters bi-plane, and the young men have been building the machine at the place where the flights were made since the first part of March. At that time the parts of the machine were packed in boxes and at the ranch the machine has been assembled and gotten into splendid working condition. It is one of the strongest flying machines on the market, and its dimensions are about thirty-four by forty-four feet. Associated with Wiseman and Peters are Don C. Prentiss and Ben Noonan of this city. They have made a great success of their undertaking. The huge bird-like machine was off the ground for quite a goodly length of time Friday evening, and this performance was repeated many times.